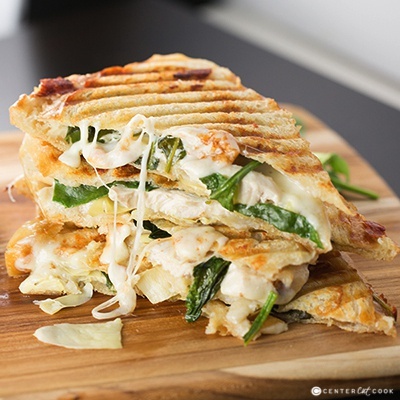 If you like Artichoke Spinach Dip, you are going to love this Spinach & Artichoke Panini with grilled chicken, marinated artichoke hearts, baby spinach, garlic spread, and melty mozzarella cheese, grilled to perfection! Artichoke Spinach Dip is one of those dips that everybody just loves, whether it’s served warm or cold. 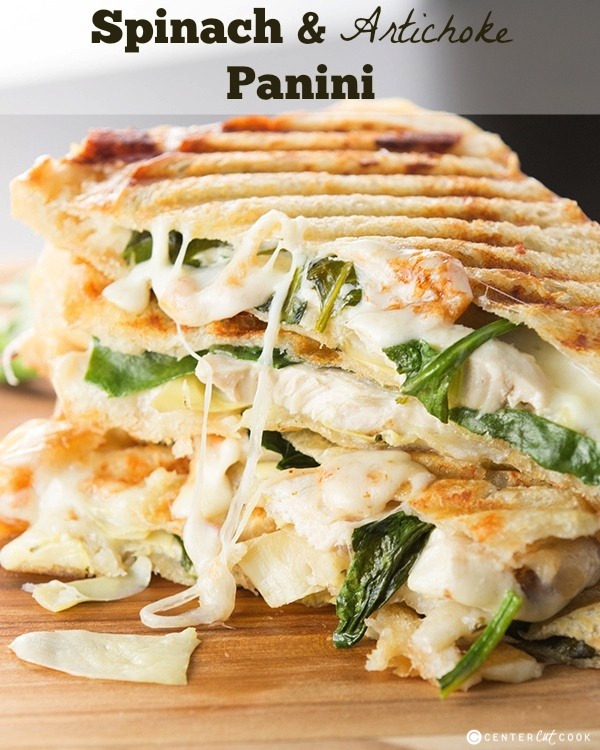 It has always been without a doubt, one of my favorites, which is why I decided to put a fun twist on it and turn it into an amazing Spinach & Artichoke Panini! 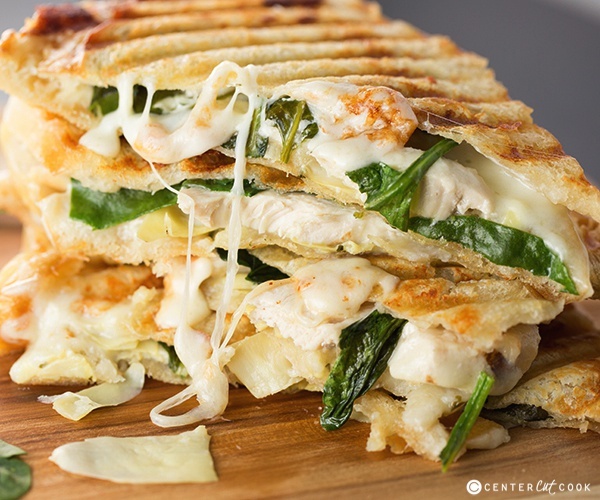 Who can say no to a sandwich bursting with flavor with marinated artichoke hearts, grilled chicken strips, lots of melty cheese, and a savory garlic spread? 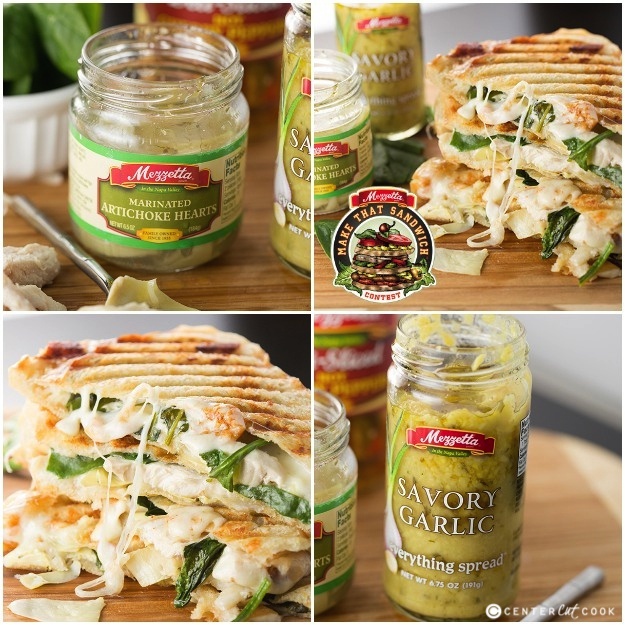 I started with the obvious ingredients – melty cheese, spinach and Mezzetta’s Marinated Artichoke Hearts. But I wanted to add an additional layer of flavor which is when I decided to spread a thin layer of Mezzetta’s super flavorful Savory Garlic Spread on the sandwich. What’s not to love about garlic? The spread complimented this sandwich just perfectly! Both the Mezzetta Marinated Artichoke Hearts and Mezzetta Savory Garlic Spread can be found in the condiments aisle of your grocery store. I found them in my grocery store by the pickles. Once my sandwiches were all assembled, I used a panini press to grill them to perfection! If you don’t have a panini press on hand, don’t worry, just use a griddle of whatever you’d use to make a grilled cheese and you’ll still get stellar results. Look at the ooey gooey cheese just oozing from this sandwich! It’s complete and utter perfection! Summer is such a perfect time to make sandwiches because they are super quick and easy, and you can load ‘em up with all kinds of fun ingredients including garden fresh vegetables! The best part is that you can customize each sandwich to suite everyone’s tastes including picky kiddos. If you were going to make the most perfect sandwich, what would you put on it? The options are endless, aren’t they? Evenly spread butter on the outside of two slices of bread. Arrange the buttered side face-down. On one piece of bread, spread a thin layer of cream cheese. On the other slice of bread, spread a thin layer of Mezzetta Savory Garlic Spread. 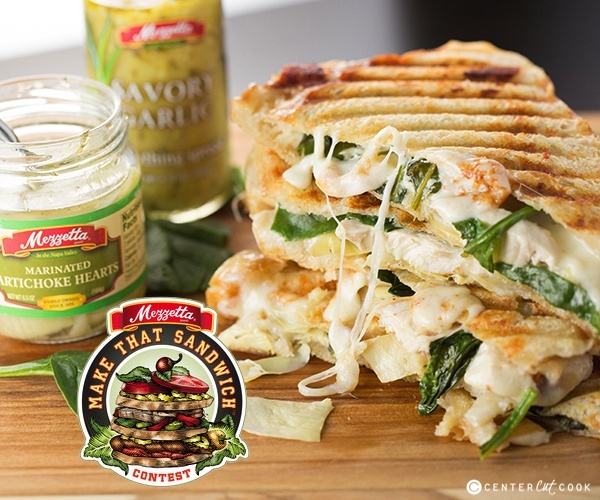 On top of the garlic spread, add 3 ounces grilled chicken strips, chopped Mezzetta’s Marinated Artichoke Hearts, 1/4 cup baby spinach, and 2 ounces shredded mozzarella cheese (use more cheese if you’d like!). Top with the second piece of bread with the cream cheese spread, buttered side facing out. Repeat the process for the remaining three sandwiches. Heat a panini press or a griddle pan to medium high heat. Cook the sandwiches for several minutes on each side, or until the bread is golden brown and the cheese has melted.